Sunday afternoon/early evening we made ourselves a BBQd feast of meatballs and the left over rissoles with a BBQ sauce and rice. We then headed over to the Tavern at the Lodge as we'd seen a Reptile Show advertised. Whilst we waited for the main event we salivated over the amazing carvery on offer, but felt satisfied that our dinner had cost only a quarter of the price of one roast dinner so treated ourselves to a dessert instead = cookies and cream cheese cake covered in Oreos! As we finished up a gentleman entered with various sized crates and boxes and he was our reptile expert Rex. We were introduced to the lizards and snakes from his reptile centre in town and enjoyed his very camp presentation and odd jokes. We also found his talk very insightful as we learnt how to evade the perils of venom as well as what to do when bitten and felt assured by the end of the speech that we at least will not die straight away if attacked when out on our next bushland walk, plus 90% of bites don't even require anti-venom! At the end of his demonstration he was happy for us to have a hold and cuddle of some of his creatures so I had a lovely long snake draped round my neck and patted a few lizards, whilst Edd took on the role of photographer. We then said goodbye to the Rock wallabies by our room and found that two of them had joeys in their pouches, and one kept poking out for a feed which was cute and odd at the same time. The next day we checked out and had a couple of hours to kill so chilled by the pool for a bit then got the shuttle into town and had a KFC All Star bucket as a treat (with sweet potato fries as a 'healthy' extra). We then got the next shuttle back and headed to the airport and on to Cairns via a two hour plane journey. Arrived just before 8pm east coast time and got our hostel's shuttle bus to the Calypso Backpackers. Very vibrant colours and people greeted us so we went for a walk down the Esplanade to relax before bed and found that our research was lacking somewhat as neither of us knew that Cairns had no beach access. Instead it has a manmade lagoon to swim and sunbathe at, but you can't access the Coral Sea from the shore at this point as it's marshland. Too tired to eat so we attempted some sleep, but found that our pool side room facing the bar had drawbacks as the bar is open until 12am and then an X Factor wannabe came home from a night out and decided to wail away from around 1.30am until 5am on his guitar. Needless to say the next day we looked into other rooming options as well as alternative accommodation, and got moved to a quieter room away from the pool and bar and also secured a money saving deal using our Greyhound travel vouchers that saw us extend our stay here so long as we could actually get some rest in our new room.We also spent a great deal of time trying to utilise McDonald's free Wifi = beyond slow and frustrating, but we gave it a good try and managed to at least access the Greyhound bus timetable so that we could start planning the next chapter of our adventures. On Wednesday we got picked up early doors and taken to Cairns railway station for our Kuranda rainforest day tour. We became friendly with our fellow tour members = 3 American couples all over the age of 65, and sat with them on the beautiful Scenic Railway train that wound its way up the coast and through the mountains up to the rainforest north of Cairns. We had 3 and a half hours to look around the old markets there and also made our way to the Koala Experience, as our previous day's introduction to them had not been enough. It was at this point I decided to bite the bullet and be a super tourist and pay to hold a koala and have my photo taken with it = amazing experience (the cuddling part not the photo!) We then fed wallabies and kangaroos and saw some wombats (who sleep on their backs) and reptiles before heading to the Sky Rail terminal where we started our 8km descent back to the base near Cairns in little gondolas suspended above the depths of the rainforest. Was a very surreal, but wonderful experience. As soon as we had said goodbye to our American friends and were back at the hostel we decided to sort out our next tour as the weather had begun to turn and we wanted to make sure we chose the right day to tackle the reef. The very helpful guy behind reception informed us the weather was set to be at its best the next day so we promptly booked our journey on the Ocean Free sailing boat to the Great Barrier Reef and Green Island. An even earlier start in the rain saw us head to the marina to check in for our tour. Fortunately for us ours seemed to be one of the more personal and exciting experiences as we had less people on our tour and were taking a different route to the other tours checking in and the weather burnt off as we headed out to sea using the engines. Unfortunately along the way despite me taking a travel sick pill as a preventative measure upon their offering of them, I found myself lacking any sea legs (not helped by the two muffins I had consumed as part of their complimentary breakfast!) Fortunately I did not go green as some others did over the side of the boat, but I did spend the journey lying very still on a cushioned bed under the boom. Edd meanwhile got to know our fellow adventurers and by the time we'd reached our snorkel spot at the reef lots of travelling tips and sports had been chatted about. Once the boat was stationary I felt a lot better and we got kitted up in our snorkelling gear and jumped off the boat into the lovely warm water. One of our crew members offered to take us on a tour of the reef so we swam alongside him and found Nemo as well as a sea turtle called Frank and lots of interesting coral andgiant clams, which opened and closed their metre long mouths when you waved your hands over them. We then had a buffet lunch on board before using the smaller motor boat to head over to Green Island where we had the opportunity to walk all the way around its beautiful beach and from where we saw loads of sea turtles just off the shorefront. Back on board Ocean Free we had one more chance to dive and both were fortunate enough to get really close to the black tipped reef sharks. On the journey home we caught some rays and relaxed with some treats from the crew, e.g. fresh fruit, wine, cheese and crackers and cake all were on offer as part of the experience and the sails were put to full use with the majority of the journey spent tilted toward the sea. All in all it was a super experience and we're very glad we saw the reef in this way. We made rice bolognaise for dinner and made use of our hostel's great happy hour offers whilst partaking in a trivia quiz that night with one of the friends we had made that day who was also staying at our hostel. Although we did not win, we came a close second and we did not have the luxury of Internet abled phones like the winners did. Karma also rewarded us for not cheating as we were awarded a pitcher of beer for having the best team name = The Sea Turtles. On Friday we had a sleep in and made use of the hostels BBQ breaky service to get Edd a nice bacon and egg sarnie. We also sorted out our route for the next 2 weeks and again were helped out loads by the friendly staff at Calypso who called through some of our hostel requests and booked us onto the various Greyhound buses we'll be needing. We then walked into town and did some research into our Whitsunday options and managed to get a great deal sorted for the small window we had to do it in and then went back to see our koalas at the Dome Zoo as our tickets were still valid and Edd felt the same compulsion as me a few days previously and got to cuddle a koala too. We then chilled by the lagoon and noted the increase in young people doing the same thing= Schoolies has begun over here, which is much like Spring Break, but for high schoolers. Yesterday we started our descent southwards. First stop was Mission Beach which was very peaceful and quiet with no touristy elements to it at our spot along the beach. Stayed in a lovely hostel called Absolute Backpackers, which was more like a beach house and made use of their free cassowary and wallaby tour. We were both impressed to actually see a cassowary after being informed that they're an endangered species with only 400 in the world! We then opted to walk back along the beach to our hostel as we were told it was about an hour's walk….an hour and forty minutes brusque walking later we finally got back to the wonderful sight of a free BBQ being set up. Two plates of salad and about 7 sausages later we were very happy souls, as were our fellow backpackers and we stayed up chatting to two Swedes and a Dutch girl sharing tips and anecdotes (and admiring their amazing language skills!) Today we headed on to Townsville, which is nicer than the tour guide at Calypso had implied. Had a walk along the strand by the beach in nice weather and saw a fair few people indulging in standard Aussie Sunday Session! Came back and about to have dinner now! Likely tomorrow we'll head to Magnetic Island which is just off the coast. 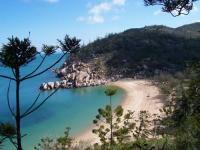 Then onto Airlie Beach for a 2 day 2 night sailing cruise around the Whitsundays. So hopefully some more swimming, snorkelling and sunbathing to come!